If the Square Peg Doesn’t Fit – Get a Hammer! It seems like I just got done writing a post which incorporated the point that Real Climate leaves much to be mocked, and low-and-behold Gavin Schmidt deals us a whopper. A fantastic new paper was written as a comment for Nature called “Reconciling Warming Trends”, which proports to explain the lack of observed warming which directly contradicts the bulk of the climate models. The first thing the media should take note of is that these scientists have finally noticed what us evil skeptics have been telling you for several years –the predicted level of warming didn’t happen! It is warming, but not enough to be a problem, and that IS a big problem for the multi-billion dollar climate industry. So for the media who don’t read things like ‘papers’ or data, the blue and green dotted lines have lower slopes than the climate models, therefore the models predicted more warming than was observed. Just like the Koch funded unfunded skeptics told you. But this new paper by Gavin A. Schmidt, Drew T. Shindell and Kostas Tsigaridis (Schmidt 14) is a true gem. The crew looked at several observed factors in climate since their last runs and found different values for the years 1990 – 2012. They looked at human aerosols, solar irradiance changes, volcanic aerosols and a “very slightly” modified level of greenhouse gas forcing. The resulting change in model forcing brought the models in line with observation — almost. Well they still are higher than any actual observation but adjusting moisture feedback (a large and uncertain factor) is not a sanctified IPCC consideration. Of course they only show the years since 1990 which is hilarious considering that they are addressing a massive failure of the centennial-scale models to predict even a decade into the future. Note that despite the efforts to “find” an explanation, moisture feedback, the greatest unknown in climate modeling, was not even mentioned. Still, there is one tiny elephant in the Real Climate corner. A claim as specious as the claim Michael Mann makes of being exonerated from wrongdoing by the fake Muir Russel climategate report, yet very often made by the Real Climate crowd. For the heck of it, I searched Real Climate for phrases like – ‘not tuned’. 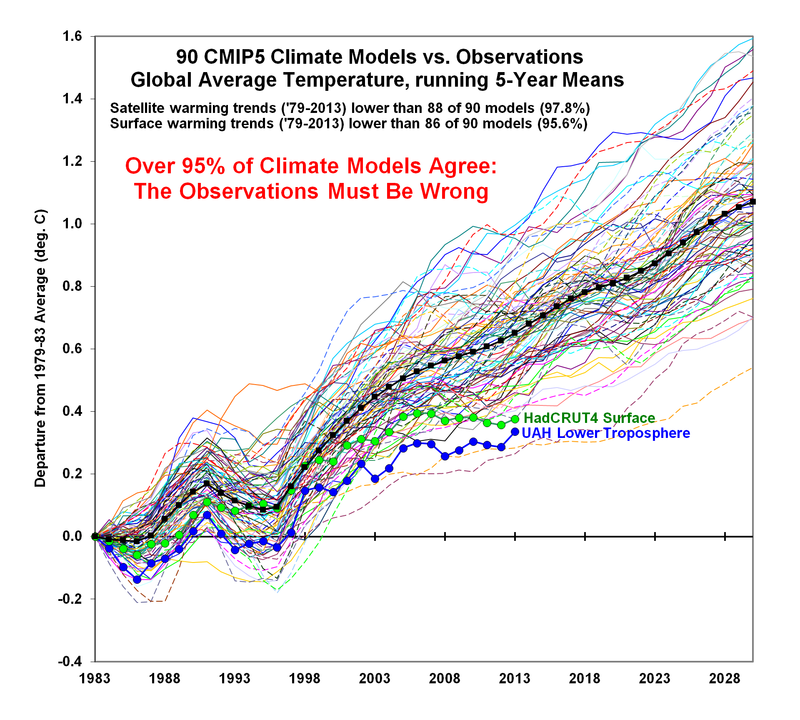 From RC Frequently asked questions: Are climate models just a fit to the trend in the global temperature data? No. Much of the confusion concerning this point comes from a misunderstanding stemming from the point above. Model development actually does not use the trend data in tuning (see below). 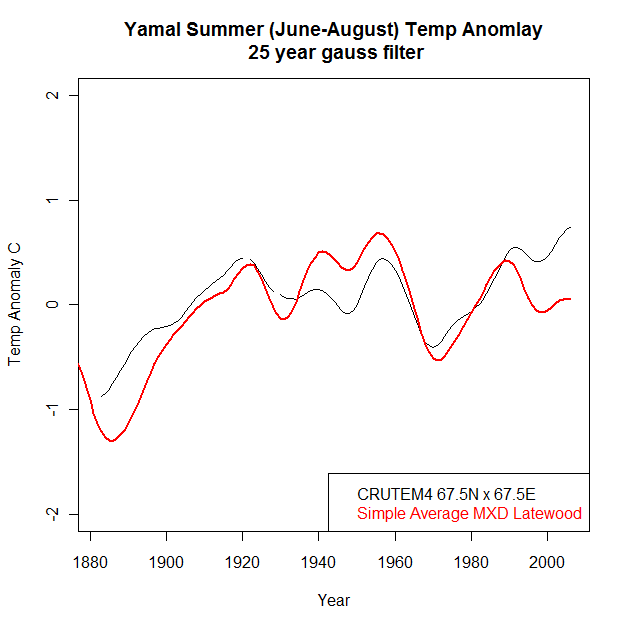 The models are not tuned to temperature trends pre-2000. What is clear to most of us “skeptics”, and should be very clear to any semi-technical type, is that in modeling, with hundreds of tweakable parameters, if the output doesn’t match the observations, you go back and tweak the input until it does. Gavin’s insistence that models aren’t tuned, is simply his own bias forgetting those hundreds of times when he put CO2 forcing in upside down or with a ridiculous weighting by accident or by test and the result didn’t look at all like he expected, so he adjusted things. He and many others rightfully find it easy to justify the adjustments post hoc – e.g. the paper they just published. It’s not wrong to adjust the model, they should match the data, but they universally, definitely and regularly are adjusted until the output matches some observation. In this case, the models were so far out of whack, they quietly admitted that the skeptics were right, and adjusted their favorite inputs only. Other inputs were quite thoroughly left out. What is more is that most of the inputs had little effect but by ‘re-analysis’ they made massive corrections to volcanic forcings, only in the recent time-window to correct recent trends. Nevertheless, attributing climate trends over relatively short periods, such as 10 to 15 years, will always be problematic, and it is inherently unsatisfying to find model–data agreement only with the benefit of hindsight. There is no analysis in the article of expected short term variance which could possibly explain the models failure. It simply doesn’t exist. This primary aspect of Gavin’s conclusion is much more like a prayer to Gaia than an article of sicence. As is often the case the Real Climate train-wreck provided us some solid entertainment. I wonder how many more decades will pass before they will figure out that the modeled climate feedback sensitivity looks a little high? While Phi made the claim that the trees bear out UAH lower troposphere data over ground temps, I don’t see a single instance of a better fit of tree data to one temp series over another as particularly solid. This is particularly true considering that there are known divergent datasets. Still, it seemed reasonable that Phi had picked out an excellent dataset from the literature to look at. I took my time and downloaded UAH and RSS satellite data, the tree data from Briffa 2013 and found gridded data from CRUTEM4 using the google world map application from this RealClimate™ post. I actually went over to that blog to see if there was anything humorous to tease them about and found a very workable application – so shame on me! Of course, shame on them for having so much to mock but that is for another post. It took a bit of fiddling with the calibration and filtering but I was able to reproduce a reasonably similar result to Phi. All temperatures presented below are from summer (June to August) averages of the 67.5N 67.5E gridcell closest to the tree data. 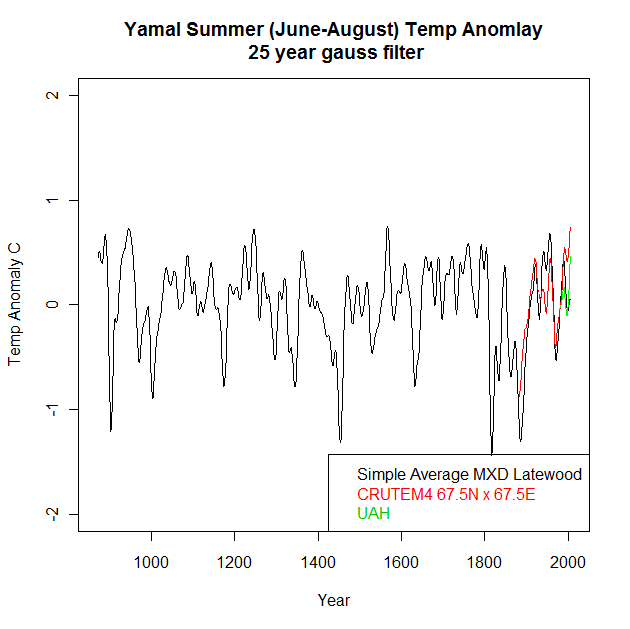 What I find amazing is how good a fit this data actually is to historic temps in the recorded period. First, recall that I made this red series above by simply aligning and averaging the data. I did this simple process with the understanding that some of the variance we see in these MXD series is from a statistically significant age related signal, so this series average is not as good a representation of annual tree MXD as it could be. Still, the age correction won’t make much difference and even the oldest portion of the data doesn’t diverge terribly from the black observed temperature curve. One of the main contentions I have with treemometers, besides massive non-linearity, is that the high frequency components and low frequency components aren’t necessarily governed by the same relationship and that those relationships with environmental conditions will change over time. e.g. how does the same tree respond to temperatures in low water vs high water conditions? The data from this set is truly fantastic compared to some we have looked at but you can see a large divergence of temperature above tree latewood density in recent years and a similar problem in 1880-1990. 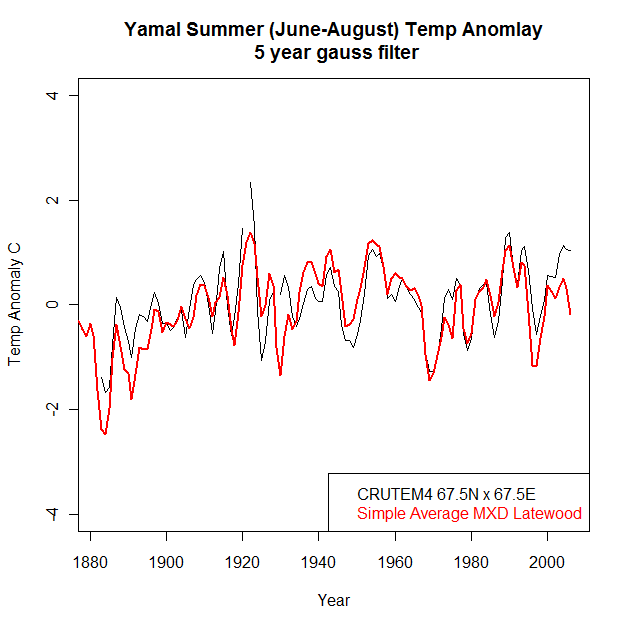 We could shift the graph up and down to try for a better fit but it seems pretty obvious that the trees are reacting to other environmental conditions than temperature as years go by. The visual correlation is still amazing though. While it may be tempting for climate scientists to take this kind of data and paste temperature onto it, calling it a development or something, they may not find the whole reconstruction that exciting. The rest of the data is fairly interesting to those of us skeptical of the general exaggerations pervading the science of global warming doom. Below is the full MXD reconstruction with temperatures to 2006 overlaid. Like this years RedWings, it seems to be a hockey stick without a blade. I’m still amazed at the quality of the fit to CRUTEM though and have decided to continue this study and take the next step of correcting by the average growth curve and perhaps the pith offset as well. As always, I intend to make the code available. Unless someone is interested, I will clean it up and post it with my future calibrated reconstruction post. I heard a radio host in Kalamazoo, comment on a letter written in by a listener on emotion and opinions. The idea was that emotions and opinions cannot be wrong and at least the emotion can’t-be-wrong claim is a common thread in human culture and one of my apparenlty numerous pet-peeves. First, emotions are chemical and electrical reactions to lifes inputs. We have little control over them but we can control them. For example it is quite possible to be angry about something we shouldn’t be. Say there is an individual who vociferously describes an opinion on a scientific matter that goes against basic scientific observation, sometimes that makes me angry. Is that anger right or is it wrong? One could step back and observe that the individual making the false claim is not at fault for lacking the mental faculties to parse the nature of the issues and change the emotion. Either way, anger, really doesn’t make sense in those sorts of cases, yet I do get grumpy about incorrect statements. It seems like the emotion ‘anger’ is wrong in this situation, although it is a mild example. Joking asiade, this radio host was hollering amen’s and thank-yous after reading a letter which in paraphrase claimed that not only emotion, but opinion cannot be wrong. In my “opinion” the host and the writer are both wrong, so someone in our group of opinion holders must by definition be wrong. To me this whole concept of any form of belief-based infallability is another symptom of our mentally self-pleasuring progressive culture. The excited host presented the issue so strongly that it left me thinking that infallability of opinion is the next frontier for the only slightly less ignorant concept that emotion cannot be wrong. I hope our progressive cancer isn’t going in that direction, it literally seems impossible to deny reality to the level we already do in society so I suppose we shouldn’t be surprised. A recent article on the global warming hiatus garnered a bit of attention in blogland and the substantially less technical mainstream media. It was published in Nature Climate Change: Recent intensification of wind-driven circulation in the Pacific and the ongoing warming hiatus. Of course the media ate up the work as though it were a perfect explanation for the utter failure of climate models and inaccurately assume that it means business as usual for them. There are several issues with the work that I find interesting. An “unprecedented” trade wind in the past two decades leaves a skeptical mind questioning how this was determined and documented. We are all too familiar with flatly false examples in climate science of claims stating “unprecedented” ala Michael Mann’s hockey stick. The moment the word is used with weather, I am already on edge. But it leads me to wonder just what the cause of this unprecedented wind is. Could this wind be driven in whole or in part by warmer than average air? An unexpected negative feedback? Of course a wind mixing the ocean would create cooler air. There is massive of heat capacity in the ocean which has been discussed at this blog and at many others. If the ocean is mixed, the cold water is exposed and more heat transfer ensues. I’m much more concerned about cold air from a mixed ocean than I am about any form of warming. Bob Tisdale did a WUWT post on the matter pf ocean temp in models vs observations a couple of years ago. 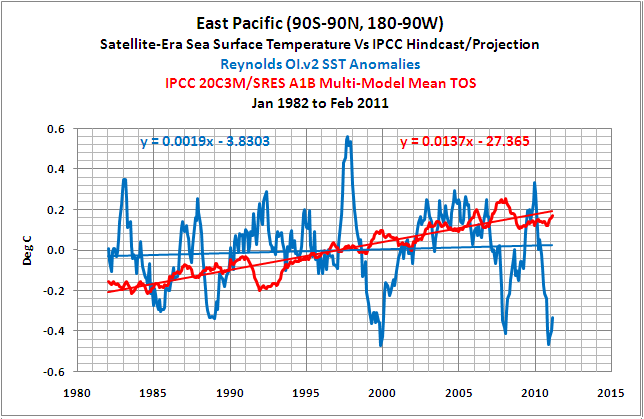 He showed that in particular the East Pacific was falling way behind model projections. As people are just now becoming aware, almost one hundred percent of the government funded climate models have a global mean surface temperature trend (not jsut ocean) which is higher than observation. This is very bad news for models but according to this graph below the trend in the East Pacific is a whopping 6X less than the IPCC A1B model (likely from AR4). The situation is so bad that scientists who have staked their careers on massive warming are digging deep for explanations for the problems. What is interesting about this paper to me is what it means if the scientist are actually right. What sort of implications does it have if a wind came by and knocked global temps down by 0.1 – 0.2 degrees Celsius. 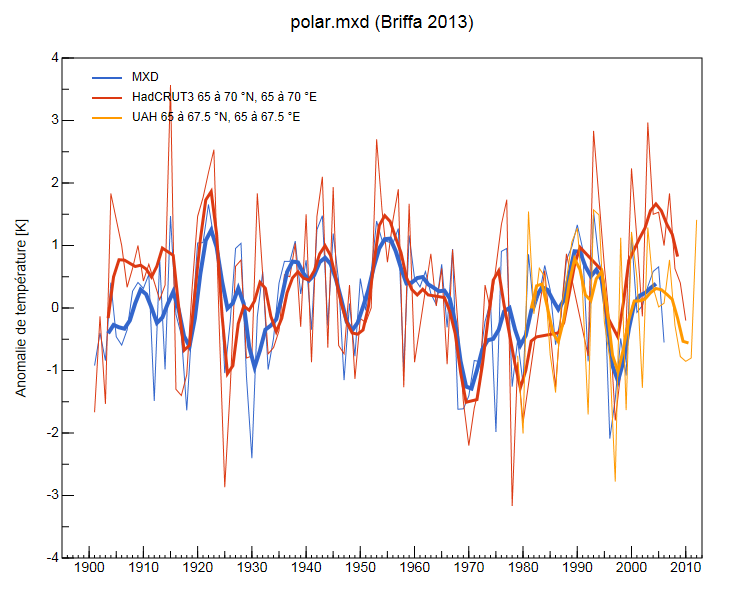 This graph below tells the temperature side of the story but immediate temperature change isn’t the only implication. Since subtracting from the spaghetti plot of models is difficult, if I visually add 0.1 C to either the red or blue observation line, that would mean that about 80% of the climate models were running too hot. If I add 0.2, the maximum correction from the paper, HadCRUT4 still falls short of the mean so this paper does not explain the differences between models and observations alone. From the half dozen other articles and blog posts, even at 1.5C, many of them would still be outside of the CI’s of the over-hot climate models. Dr. Spencer, not so tongue in cheek for climate science, writes in the graph above that observations must be wrong. This ocean heat paper actually doesn’t explain the entire model problem but unless you are looking at the data, you would think that it explained everything. This hiatus could persist for much of the present decade if the trade wind trends continue, however rapid warming is expected to resume once the anomalous wind trends abate. Ok so lets translate the whole mess so that it is understandable. – The scientists didn’t predict the trade wind and so don’t know the cause. – Basic common sense will tell us that this wind or a similar wind event very likely happened before and the “unprecedented” claim is likely unrealistic. – They modeled the wind mixing the ocean and managed to say that the heat went into the water with the same kinds of swag’s that led to missing the apparently huge pacific “wind” factor. – They then claim that perhaps in a decade when the winds stop, the original predictions of warming rate will come true. The Guardian and many other unbiased sources of knowledge for the thinking public, reported the paper as though it was certain knowledge. It even contained the typical refrain of all signs pointing to accelerating warming which is a flatly fraudulent statement considering that they are simultaneously composing an article explaining why warming isn’t happening. No questioning of logic, no notice of the inconsistency with their own or other articles they are publishing about the amazing quality of government science. And it is all placed right next to the articles bashing “skeptics” like me and you who just happen to be able to read a graph. Eventually the data will decide the argument but it is very very strange that the data is so heavily on our side and we’re the ones who are marginalized by those who hold themselves out as the intellectuals of our time. Brandon Shollenberger is collecting a list of Michael Mann’s screwups. I’ve thrown in a short thousand words myself. I could have kept going but I’m showing more restraint in my old age…. :D If you have your own info to add, I’m sure he would be happy to collect it. The list is intended as support for Mann’s defamation lawsuit – that I suspect may not go as well as he hopes. I think Brandon may need to pay for more drive-space before this list is over. USA today published yet another climate rant on the state of global warming. This time they tied it to the polar vortex that is still freezing our ___ (insert anatomy here) off. The article is filled with the ‘local is not global’ and ‘weather is not climate’ (until they say it is) mantra that has been so common in recent years. The problem that AGW scientists and left-wing mouthpieces have is identical, while things have warmed a tiny bit, the stupid thermometers are falling well behind the not-so-clairvoyant, modeled projections of planet-wide doom. Well the general media seems to have congealed on a temporary strategy at least. The collection of like-minded opinion is not a conspiracy between writers, but rather an obvious shelter during the cold. Strategically, it is basically a placeholder until something happens that looks politically better for global warming activists. The formula is to keep repeating that cold is still consistent with models, ignore the fact that a decade ago they were claiming we wouldn’t have nearly as much snow today, and tell people that warm is still coming tomorrow, and scare them that in the future we won’t have snow. They could almost run the same articles from years ago and just insert new pro-AGW weather events between claims of weather is not climate. How many weathers does equal a climate? I’m sure that all of us agree that a single weather event does not define climate, but even the ever-left USA Today needs to recognize that eventually the summation of weather events does equal climate. I’m sure the progressives™ would be hard to pin down on this particular question but when the summation of weathers doesn’t exhibit the predictions of climate, a little reality check is in order. The no “good” data quicksand. But climate scientists are 95% to 100% sure that human activity — emission of greenhouse gases — is the dominant cause of dramatic warming. It makes me giggle. What can I say. The dramatic warming of Earth to date is minimally detectable 0.85C since the beginning of the 1900’s (IPCC AR5), it shows no sign of accelerating and falls under half the rate which the average climate model predicted. The models require not only more warming, but an accelerated rate of warming for the IPCC doom scenarios to become remotely plausible. Many of us science minded observers, reasonably question the validity of any of the “doom” scenarios themselves, as they are based on what can only gifted generously with the term – speculation. What’s more is that the speculation, is being published as though it were science. Science traditionally requires data, so our hapless author teams are oft pressured into statistical falsification of results, aka”scientific speculation”. See warming attribution sections of various butterfly, sheep, glacier or fish shrinking studies for endless examples. This tendency to fabricate the supporting data of a study is to be expected when the speculation in question supports and improves the funding which in turn supports the studies. It seems to me that the USA Today article found themselves in the same boat as our palm-reading climate scientists. Since the AR5 summary which USA Today linked to is full of big words that don’t say what USA editors wanted, a little caricature of reality was required to support their progressive™ intent. I wonder how many of the thousands of readers will check the AR5 link for accuracy? Exxon – send checks ASAP! USA ends their prayer to the climate model gods (which are apparently different gods from the climate gods) to bring change to the evil right-wing legislators. The damage will only be compounded if it becomes an excuse for yet another year of denial and delay in addressing climate dangers. It seems that USA Today is in denial again. As it stands, the EPA and Obama have been proceeding full speed ahead on their insane concept of building windmills, bankrupting coal power, generally limiting combustion energy wherever possible (even beach fires) and increasing usage costs through regulation and governance at a truly unprecedented rate. It is so bad that despite massive energy cost increases, brownouts are becoming something we are dealing with more often in the US now. The authoritarian leftists couldn’t move forward with limitation policy any faster if they tried, but for USA Today it still isn’t fast enough. Meanwhile, the truly dim-witted liberal politician’s attempts to take the lead from global progressive™ reporters, and change global weather by adding costs to combustion energy for only one country on the globe, have scientifically zero chance of success. The nothing-new-news is that these writers are very, very, ignorant people with strong opinions and big pens. We are inundated today with so many anti-progress media voices across the planet hollering the same message, that society unwittingly bends to their will. Eventually, because CO2 emission won’t actually be stopped or slowed appreciably by government, the data will prove out that warming isn’t actually a bad thing at all. Unfortunately for us, the law and policy, which are likely the true damage of global warming, are being implemented and tightened today. Equally unfortunate for us citizens, government policy worldwide has proven much more intractable than the CO2 in our atmosphere could ever be. 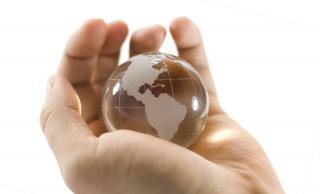 There is little we the oppressed can do to fight the global ignorance epidemic, so I blog. Whether it changes opinions or not, it at least puts a little rebuttal to the near-omnipotent global media in public view. Since, according to climate scientists, there has been literally zero detected increases in hurricanes, tornadoes, rain, snow, earthquakes, locusts, drought, flood, etc.. and since the polar ice cap didn’t choose to melt …. again….. it seems that we need a more pragmatic and more scientific list of global warming effects than can be produced in aggregate by warming-centric government funded scientists. To that end, I have compiled a new list of weather trend predictions for the future. My list is statistically and scientifically falsifiable and even more appropriately, is one that the common person can really get their heads around. Think of it as common sense. This list is unabridged and contains every weather event that will statistically change in frequency and strength, and has an asterisk by those that you will experience or scientists will measure that will be attributable to man made temperature change in the next 40 years.